Click the button below to add the Copper Range Hood '0225' to your wish list. This colonial vent hood made of hammered copper has been decorated with dark straps. It is made in both wall and island version and several sizes. The exterior hood copper can be treated with natural, honey, coffee and antique patinas. The vent hood on the photo has been fabricated in in coffee. If you need the hood modified for any ventilator system, select $200 custom work in the options menu. Along with the order please specify its manufacturer and model number or provide its installation manual. The colonial vent hood is also available with preinstalled economy blower, light and filter. It takes on average four weeks to deliver to the US destinations. 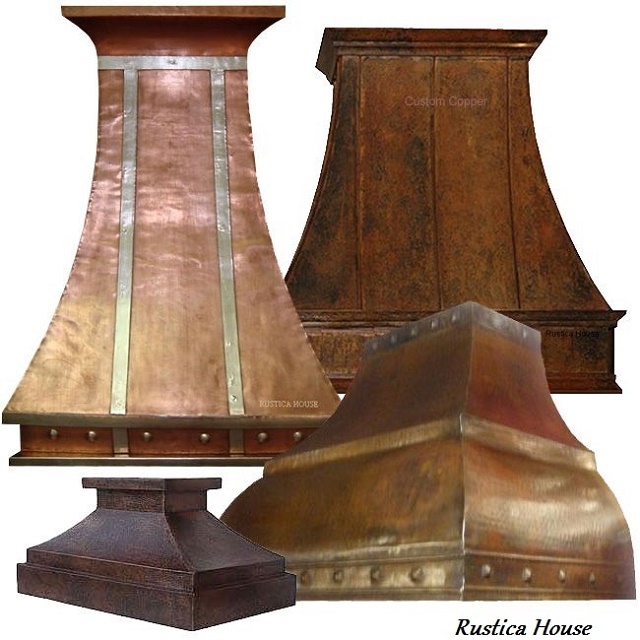 Rustica House store suggests contacting an experienced appliance installers for the colonial copper vent hood connection. When caring for a range hood made of copper and its decorative paron pattern do not use abrasive cleaners, brillo pads nor sharp brushes. Wash with warm water detergent solution while gently scrabbling with a nylon brush. Dry it with a soft cloth or paper towel. Don't allow any contact with acid foods and most tropical fruits. Orange juice, ketchup, lemon or kiwi may cause discoloration of vent hood copper.